Part 2 of the article by Dr Sotirios on Muscles, Matters and Types. Dr Sotirios provides the lecture for the KT Training Foundation BOTOX training course. This content compliments our foundation course. The full article and more can be found in the online members area. See Part 1 of the Muscles Matters<< article. Skeletal muscles are also referred to as “striated” because of the stripped appearance of their cells (fibres) under miscroscopy. Most skeletal muscles are attached directly or indirectly through tendons to bones. 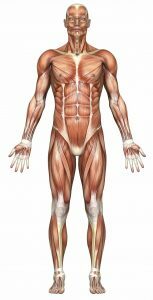 Skeletal muscles are also attached to cartilages, ligaments, fascia, organs (the eyeball, for example), to skin (facial muscles), and to mucous membrane (intrinsic tongue muscles). Muscle cells attached to the skeleton are often very long – up to 20cm – and bridge the attachment points of the muscle to the skeleton. This arrangement allows the cells to function independently. The total force produced by a muscle reflects the sum of the forces generated by its active cells. The musculoskeletal system is arranged so that gravitational loads are borne by the skeleton and ligaments. Skeletal muscle cells are normally relaxed and are usually recruited to generate force and movement. Skeletal muscles produce movement by shortening; they pull and never push. In contrast to skeletal muscles, smooth muscle –so called because of the lack of striation in the appearance of the muscle fibres under microscopy- cannot function independently. 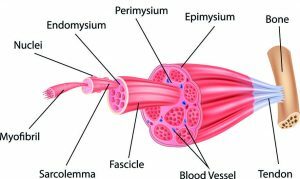 Smooth muscle forms a large part of the middle coat or layer (tunica media) of the walls of most blood vessels and the muscular walls of the digestive tract, bladder and uterus. Smooth muscle is also found in terminal bronchioles of the lungs, skin such – arrector pili muscle that attaches to the base of a hair follicle at one end and to dermal tissue on the other end – and in the eyeball, where it controls lens thickness and pupil size.2 Cardiac muscle is distinctive because it has properties of both skeletal and smooth muscle. Cardiac muscle forms a hollow organ and contracts as a unit, but it also has the cellular structure and high-power output of skeletal muscle. Some cardiac muscle is also present in the walls of the aorta, pulmonary vein, and superior vena cava (SVC). Cardiac muscle contractions are not under voluntary control. Heart rate is regulated intrinsically by pacemaker cells composed of specialized cardiac muscle fibres that are influenced by the autonomic nervous system (ANS). Pacemaker cells of the sinoatrial (SA) and atrioventricular (AV) nodes have unstable membrane potentials that decay spontaneously to produce an action potential without having to be stimulated. The range of activities that muscles carry out in the body is extremely broad, so it is not surprising that muscles show a wide range of functional adaptations that specifically suit their many tasks in the overall function of the body. Our central and peripheral nervous systems function by gathering information and instructing muscles to take action in response. This coordination between nerve and muscle enables to walk, talk, express ourselves (facial muscles), digest our food, defend our bodies, propagate our species, and do almost everything else that we do. In addition to effecting changes prescribed by the nervous system, muscles also help to regulate what goes into that system by adjusting the sensitivity of our sense organs (e.g. stapedius muscle in the ear). Some muscles are under neural control, while others are more independent. Very few muscles, however, are totally independent. The degree of neural control serves to adapt various muscles to their special roles.3 Muscles enable our movements and help us to maintain an upright posture. Muscles are also involved in the control of body temperature and regulating many important body functions. For example, they control the movement of substances through the tubular structures (such as intestines) and expel waste material from the body (via peristalsis and mediated relaxation of the sphincteric mechanisms). Another important regulatory mechanism in which muscles play a central role is the regulation of blood pressure. This involves a complex interaction between the heart, which pumps the blood, and smooth muscles that controls the diameter of the blood vessels. 1. Berne RM et al. Physiology. 4th edition. Mosby, Inc. 1998. 2. Moore KL, Dalley AF. Clinically Oriented Anatomy.4th Edition.Lippincott Williams & Wilkins, 1999. 3. Rhoades R and Phlanzer R. Human Physiology. 3rd edition. Saunders College Publishing, 1996. Subscribe at the foot of this post to receive more educational resources. 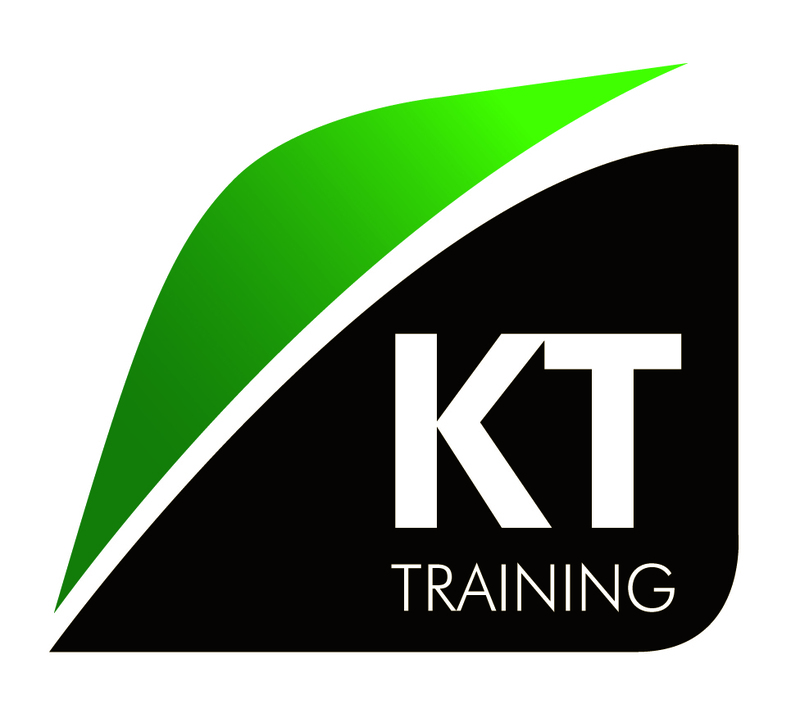 The muscle physiology and anatomy is part of KT Training core knowledge. All of the study material including the full lecture will be provided to our candidates before attending the BOTOX training course. The BOTOX workshops are mainly practical, you will be injecting patients in a clinic environment.